It's kind of like the whole chicken and egg thing. I'm not sure which came first but you need both of them. 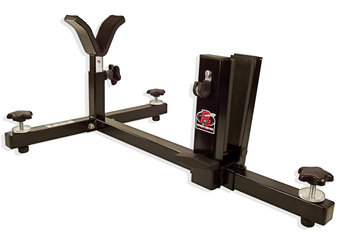 I have been using the Gun Vise with the Shooting Rest Attachment for a couple of years now but just have not made the time to write up a product review. The delay isn't all bad though because now I can speak from true experience with the equipment instead of "looks like it will work great". 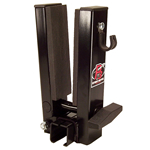 I have used it on all all types of long guns and handguns and it really is an indispensable piece of equipment. Let me start by telling you about the "Shooting Rest". As you can see in the picture the rest has 3 leveling legs with lock nuts. The front V is fully adjustable and has an adhesive ruler on it so you can repeat the settings or whatever other purpose you can come up with. 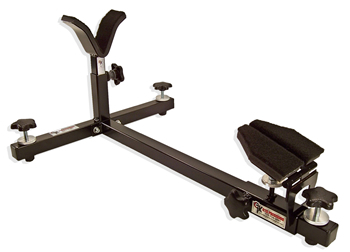 The angle of the rear rest is adjustable to fit the stock and support it well no matter where the front rest is adjusted to. The rear rest also slides on the square frame tube to accommodate both the rifle and the shooter. If you want to use it as a handgun rest, simply slide the rest all the way forward on the frame and level it off. The square tube frame is designed to hold 25 pounds of lead shot. Both the front V rest and the rear rest have chemical resistant dense foam rubber about 3/8" thick and then that has a nylon fabric like automotive carpet glued to it. The rear rest is designed to bend backwards under recoil should you happen to let the pistol grip stock come in contact with it. I was able to prove this and scratch my gun all at the same time. Don't park the pistol grip against the front edge of rear rest ! It's a REST not a BRACE. Now I will say that this shooting rest is just a little un-handy for fine adjustment of the front V elevation once the gun is on the rest(s). However, because of the slope of the rear rest you can slide the gun forward or backwards to serve the same purpose of adjusting "front elevation" and this works well. At the shooting range it's a little tricky to hold the gun and adjust the scope on your rifle. This rest is only a rest and not a cradle. Leaving the gun on the rest and going to check your target is not a good idea. I have not let a gun roll off of the rest and fall but I've come close enough to quicken my heart rate a little. But again, it's a rest not a cradle. Back home at the work bench is where I really think this piece of equipment shines. When you add the Gun Vise Attachment, this rig becomes a completely different animal. The Gun Vise Attachment can be added or removed without removing the back leg of the rest while the Shooting Rest is not so easily swapped out. My solution is to simply leave the shooting rest on the frame all the time. I can walk up, lay a gun on the front and rear rests slide the Vise Attachment to the appropriate position and clamp the gun down. If I am trying to determine a problem with a gun I can roll the gun over to get different views. Once I find the angle I need, then I lock it down. Which brings me to my favorite part of this equipment. I have found that I can lock any gun in place at darn near any angle I need, literally. Be it on it's side, top or anything in between. I use the rest/vise for cleaning and for working on long guns and handguns. I've held guns in place to drift out sights and pins, mount scopes, bore sight guns, scrub bores, you name it. It has become one of those tools I couldn't live without. You can slide the Gun Vise Attachment out in the middle of the frame, clamp down a handgun and have access to it from any angle. The clamp is even strong enough to hold a slide back. It's shines here to if you need a closer look at something on a handgun. It keeps your hands free for tools and you can get in close with a magnifier or what ever you are trying to do. In spite of the pounding I have given this rig, I could wipe the dust, grime and chemicals off of it and you would be hard pressed to tell if it had ever been used. CTK obviously did their research and chose materials and finishes that will stand up against wear and tear. If you are still cleaning your guns on the kitchen table and or shooting off of a rolled up coat, do yourself a big favor. It's a one time investment that you will use for years and years. Visit the CTK Precision web site for current pricing, features, options and other well designed products.